The Livingston Police Department has investigated 3 separate incidents within the last week in regards to canines being left unattended in motor vehicles by their owners. These investigations are treated as serious cases due to the extremely hot outside temperatures ranging from 91 degrees and higher while the temperatures in a vehicle register much higher without the vehicle running. Livingston Police Department was dispatched to the Walmart Supercenter located at 1620 W Church Street after receiving a complaint of a canine being left unattended in a motor vehicle. Upon officers arrival the vehicle was located along with the canine unattended inside the vehicle. The canine was removed by the officers and placed in a cooler environment with air condition while the owner(s) were located. After further investigation and speaking with a witness it was determined that the canine had been left in the hot vehicle for a long amount of time. The owners were located and arrived back to their vehicle while officers were still on scene. 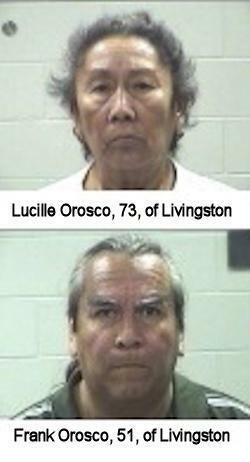 The owners were then identified as Frank Orosco(51) and Lucille Orosco(73) of Livingston. The owners were later arrested and charged with Cruelty to Non-Livestock Animals which is a Class A misdemeanor. Livingston Police Department was dispatched to the HEB Supermarket located at 1509 W Church Street after receiving a complaint of a canine being left unattended in a motor vehicle. Upon officers arrival the vehicle was located along with the canine unattended inside the vehicle. The canine was removed by the officers and placed in a cooler environment with air condition while the owner(s) were located. After further investigation it was determined that the canine had been left in the hot vehicle for a undisclosed amount of time. The owners later arrived back to their vehicle while officers were still on scene. The owners were then identified as Billy Parker(50) and Delois Schumaker( 43) both of New Caney, Texas. The owners were arrested and charged with Cruelty to Non-Livestock Animals which is a Class A misdemeanor. Livingston Police Department was dispatched to the Walmart Supercenter located at 1620 W Church Street after receiving a complaint of two canines being left unattended in a motor vehicle. Upon officers arrival the vehicle was located along with the canines unattended inside the vehicle. The canines were removed by the officers and placed in a cooler environment with air condition while the owner(s) were located. After further investigation and speaking with the witness it was determined that the canines had been left in the hot vehicle for a undisclosed amount of time. The owner later arrived back to her vehicle while officers were still on scene. The owner was then identified as Vicki Stimac(58) of Shepherd, Texas. The owner was later arrested and charged with Cruelty to Non-Livestock Animals which is a Class A misdemeanor. The offense of Class A misdemeanor is punishable by a fine not to exceed $4000.00 or confinement in jail not to exceed one year or both.